On October 24, 2013, Mr. Ihor Walter Bardyn was awarded the Queen Elizabeth II Diamond Jubilee medal at a ceremony on Parliament Hill. The Queen Elizabeth II Diamond Jubilee Medal recognizes Canadians whose service to Canada and the world reflects the dedication demonstrated by Her Majesty’s 60 years on the throne. 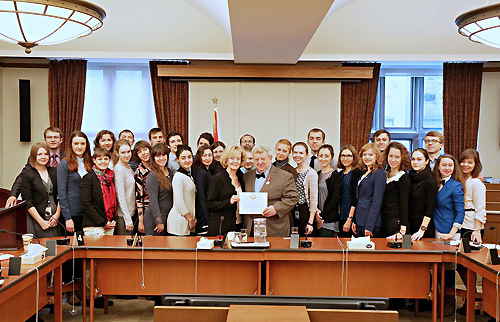 The Canada Ukraine Parliamentary Internship Programme (CUPP), which Mr. Bardyn founded and has directed since 1991, offers opportunities for students from Ukraine, the Ukrainian Diasporas of Western Europe, Belarus, Georgia, Russia and Canada to experience and learn about Canadian Parliamentary democracy through internships in the offices of Senators and Members of Parliament. Some 35 CUPP interns attended the ceremony on Parliament Hill. A practicing lawyer from Toronto, Mr. Bardyn’s contributions to Ukrainian and Canadian history, culture, education and civics also include his work towards the establishment of the Chair of Ukrainian Studies at the University of Toronto, and the World Congress of Ukrainian Jurists (WCUJ). Mr. Bardyn also served as Chair of the Ukrainian Canadian Congress Redress Committee, which helped establish the historical and legal basis, and economic losses, suffered by Ukrainian Canadians interned during the First World War. He also authored the Trust Agreement for the establishment of the Metropolitan Andrei Sheptytsky Institute of Eastern Christian Studies at St. Paul University in Ottawa, where he served for nine years as a Councillor on the University’s Council of Administration. Mr. Bardyn was recently elected President of the Ukrainian National Federation of Canada.